Facebook is launching new tools to help you manage your time on Facebook and Instagram. The idea is to inform users how much time they’re spending on Facebook and Instagram, and give them the tools they need to make social media great again 7 Tips for Those Who Want to Start Enjoying Social Media Again 7 Tips for Those Who Want to Start Enjoying Social Media Again If you're tired of social media and don't enjoy using it any more, you might need to get back to basics. Here are seven tips for making social media fun again. Read More . Do You Use Facebook and Instagram to Excess? While many of us only check social networks occasionally, some people are hooked on them. 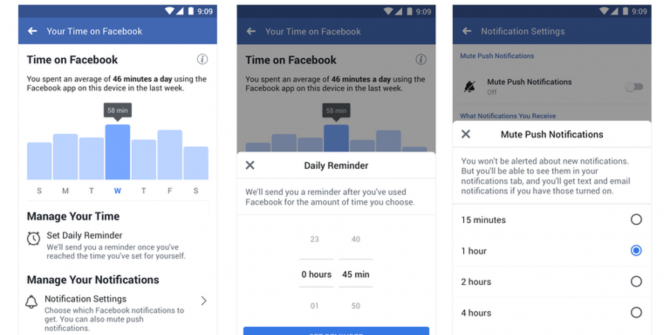 Facebook has decided to do something to help those individuals, and, as detailed in this Facebook Newsroom post, it’s introducing tools to help you manage your time. Both apps are getting an activity dashboard, a daily reminder to stop using the app after a set amount of time, and a new way of limiting notifications. All of these tools are entirely optional, and purely designed to help those people who feel they need them. To access the Facebook activity dashboard, click Settings, and then tap “Your Time on Facebook”. To access the Instagram activity dashboard, click Settings, and then tap “Your Activity”. You’ll then see a dashboard showing you how long you spend using the app. From here, you can set a daily reminder which will trigger an alert when you’ve been using the app for an amount of time of your choosing. By tapping Notification Settings, you can also “Mute Push Notifications” for any length of time between 15 minutes and 8 hours. While this may look like an altruistic move, the truth is a little more complicated than that. People are waking up to the fact that social media can have a negative impact on their lives, and some are choosing to quit Facebook altogether as a result. By offering up tools that allow users to manage their time on social networks, Facebook must be hoping to dissuade people from quitting altogether What Happens When You Quit Social Media? 6 Things I Learned What Happens When You Quit Social Media? 6 Things I Learned If you're planning to quit social media, you might have questions about what comes next. Here's what you can expect. Read More . And it might just work. After all, getting an addiction under control, is surely preferable to going cold turkey. Explore more about: Addiction, Facebook, Instagram. This is to notify people in Nigeria that this online investment company never exist in Nigeria. It is purely SCAM. Wherever you see this intertrust integrated investment limited in Nigeria kindly report it to police or any governmental enforcement agency for quick action over this SCAM company. This group have duped billions of Naira (Nigeria currency) from innocent citizens of Nigeria. They will ask you to invest any big amount and receive 25% of that amount in one week time which is FRAUD. As time goes on this intertrust integrated investment limited will fold overnight and all you have invested will go like that. They have done it to people in Enugu, Delta, Abuja, Anambra, etc, all Nigeria States. Be warned.